We were asked for help by our customers who are completing their vacation home in one of the coastal communities of Georgia. 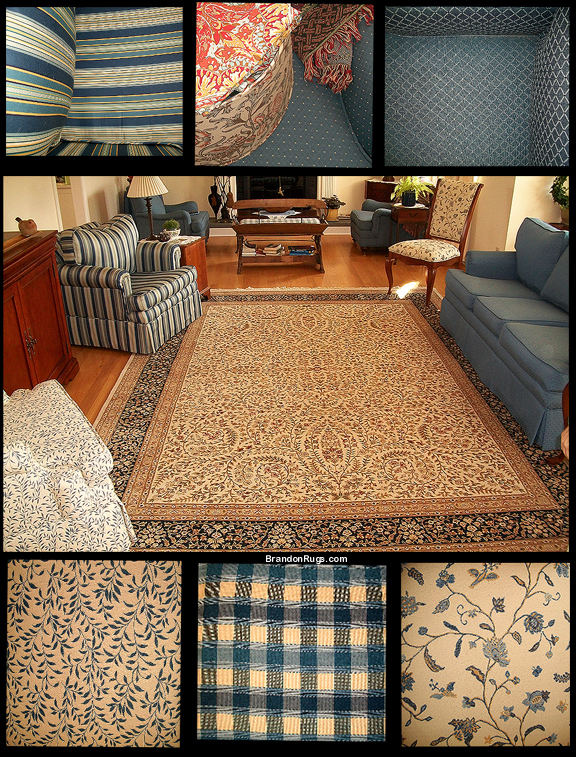 They had existing living room furniture with an area rug, and asked us to help them locate a handmade geometric style rug for the breakfast area of their kitchen. The antique reproduction Serapi-Heriz they chose from us for their kitchen is on the right side of the composite picture. 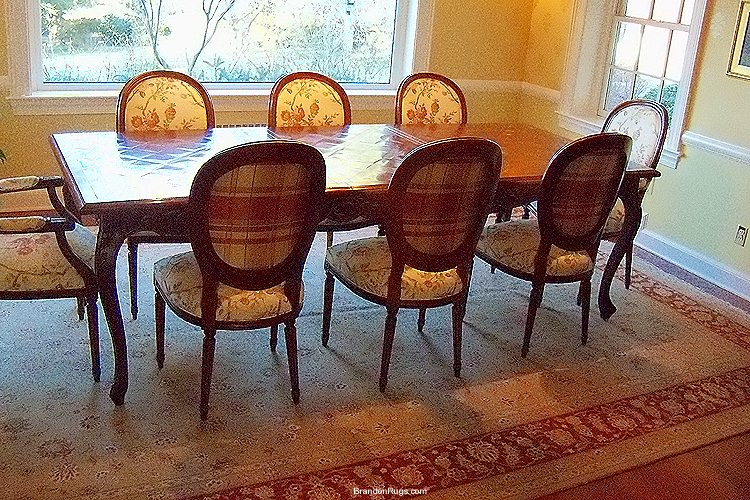 Their existing living room rug and furnishings are on the left. The hand-knotted runner to connect the two spaces was selected for coordination from the same collection of antique reproduction rugs as the kitchen rug, and carries all of the living room's palette of colors toward the kitchen. These hand-knotted stairway runners were recently installed by us in a New Hope, Pennsylvania home as part of an ongoing redecorating project by the owners. The stairway configuration is common in homes. 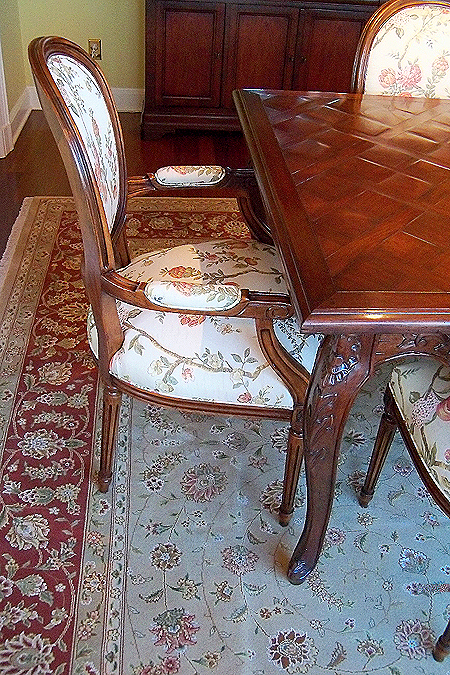 The required lengths for the runners to properly fit were non-standard however, which necessitated cutting the excess from the field of each rug and reattaching its border. This option was less costly, and achieved more expeditiously, than the alternative of commissioning a set of custom-made runners. is excellent, and the repair is not apparent. two runners are NOT sewn together. View of Upper Runner showing that it crosses the landing. Another view of how the two runners "fit"
stair-rods for securing handmade runners on stairways. it's safer because rods can be a trip hazard to women wearing heels. ﻿Our client moved into her present home two years ago from a home with a much smaller living room. She chose to use her existing living room furnishings and supplement them with additional pieces to create a multi-use space. The rug selected balances and integrates the existing colors, patterns and textures of the fabrics and brings focus to the primary seating group. 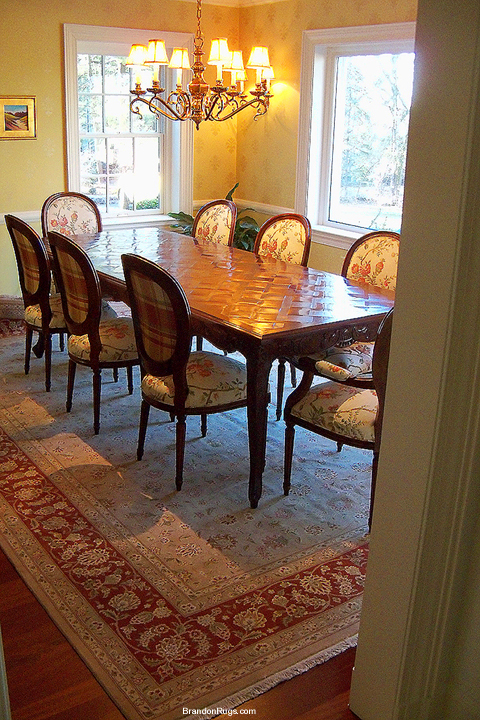 Our client recently purchased their home and selected the dining room rug as a finishing touch in their newly furnished/ redecorated dining room. 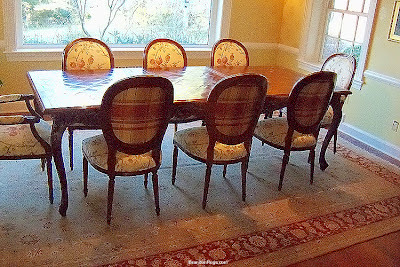 Our primary challenge was finding a rug properly coordinated with the new colors and proportioned to work with a long solid-top table placed off-center in the nominally square room.